Cook pasta in 2 quarts boiling water as package directs until almost done, but still firm. Drain and rinse under cold water, and drain again. While the pasta is cooking, prepare the tofu ricotta. Place the tofu, ume plum vinegar, scallions and shoyu in a food processor. Pulse until consistency of ricotta or cottage cheese. If no food processor, place tofu, ume plum vinegar, scallions, and shoyu in a bowl and mash with a potato masher. Place the tofu ricotta in a medium mixing bowl, add the spinach, and mix well. To prepare the sauce, heat oil in a medium skillet or saucepan and sauté the garlic for 1 minute. Add the onions and mushrooms, sauté 2 minutes. Pour in the sauce and shoyu. Cover and simmer for 10 minutes. Lightly oil the baking dish with olive oil. Spoon a ladle or two of sauce in the bottom of the baking dish. Stuff each shell with about 1 tablespoon of tofu mixture and place in the baking dish. Preheat the oven to 400°. 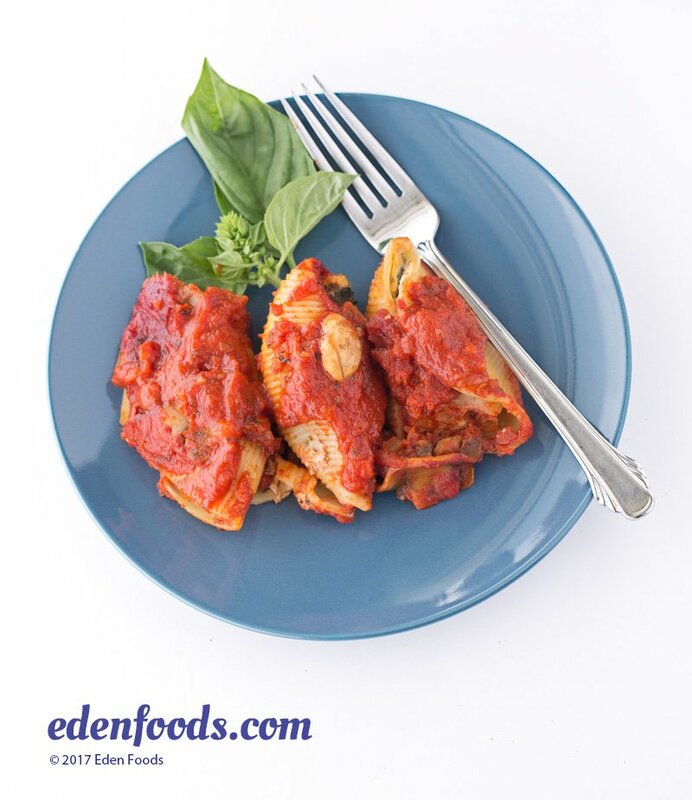 Pour the sauce over the stuffed manicotti, cover baking dish and bake for 40 minutes or until the tofu is firm.